Palm trees are a class of trees associated with elegant and luxurious lifestyle. If strolling in any of the beach districts, one is certainly going to come across different variants of the palm tree. The tropical and warm climatic condition of Florida makes it one of the best known places for growing palm trees. They are particularly used in many luxurious places and landscapes such as hotels, botanical gardens, malls,resorts and swimming pools. Palm trees are commonly used in these places, yet it is rare to find other species of trees in such areas. This is due to the many benefits that the tree come along with such as easy to maintain,low nutrients requirements, storm resistant and he wide range of species that can be selected from. There are actually more than 2500 species of palm trees and therefore if searching for where to buy palm trees in Florida, be sure to buy from a dealer with a good number of the palm tree species. This is particularly important as it gives a wider range of selection for palm trees that best fits one’s niche. 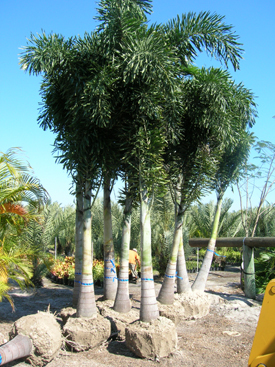 As far as quality species of palm trees is concerned, we guarantee quality and healthy palm trees of various species, colors, size and color to suit various preferences. A sample of some of our top famous palm tree species include the sago palm tree species with its native origin from the Ryukyu Islands of Japan. Sago palm is among the many fascinating plant species from Japan and one surely need no reason to have it as part of their landscape.It is well known for its adaptability to a wide range of climates varying from the tropics to the temperate climates. Another popular palm tree that we have stocked for tropics plant lovers include the canary island date palm tree,also referred to as pineapple palm due to its pineapple shape and looks. This is a highly priced species of the palm due to their alluring and elegant appearance. They have huge trunks with heavy caliper and a nut at its top. Its majestic and extensive size has made to be used to bring the extensive nature to a landscape for decades. For those who love that majestic affluence of nature, then we have the stock and consequently need not to search for where to buy palm trees in Florida. If interested in first growing variant of palm tree, then we have Washingtonia palm trees just stocked for that preference. Washingtonia can grow up 60’ high with a crown width of up to 15’. This species of palm tree grows huge with time as long as it receives good sunshine exposure. Our stock of Washingtonia will give a landscape that tropical elegant look that desired. Its readily available and costs less,suitable for use as an avenue tree. We have many other species of palm trees stocked and these are just a few of our most popular palm trees in stock. Finding where to buy palm trees in Florida has never been this easier. a good number of the palm tree species can be found at the same place and at fair prices hence no more searching.